5 − = 1 Required Please enter the correct value. WTI crude oil prices today (Tuesday) fell deeper into negative territory following a weak trading report in China and a market holiday in the United States. At 10:10 a.m., WTI crude oil prices were down 3.3% and trading at $44.55 a barrel. The U.S. benchmark cratered 6.4% last week, after one of the most volatile months since the Great Recession. 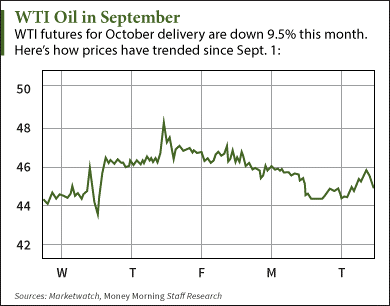 WTI futures fell 7% in August. However, Brent crude oil prices moved into positive territory today. The international benchmark ticked up 0.8% to $49.70 a barrel. Brent futures dropped 2.9% in August and are down 10.9% so far in September. Today's decline in WTI crude oil prices came after China released trade data for August. Chinese exports fell 5.5% from August 2014. That marks the second monthly decline in a row after falling 8.3% in July. Imports plummeted 13.8%, compared to an 8.1% decrease in July. Since oil is priced in U.S. dollars, imports become more expensive when China's economy weakens. As one of the world's largest oil consumers, China's weak import data could be damaging for crude oil prices if it continues in the coming months. Oversupply concerns are also adding to the downward price pressure. Last week, the U.S. Energy Information Administration (EIA) said U.S. stockpiles increased by 4.7 million barrels. That puts total U.S. production at an 80-year high of 7.9 million barrels a day. But none of this is particularly shocking. Weakened demand in China and booming production in the United States have been pushing oil prices down all year. The good news is the oil crash has bottomed out. According to Money Morning Global Energy Strategist Dr. Kent Moors, many factors will fuel a rebound in prices by the end of 2015. Alex McGuire is an associate editor for Money Morning who writes about energy. Follow him on Twitter at @AlexMcGuire92 for all the biggest oil price updates.